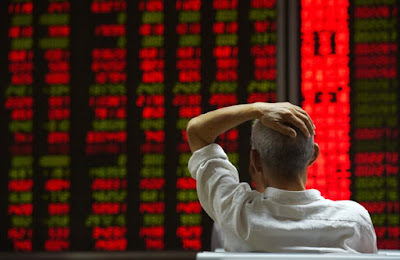 BLOGKATAHATIKU - China’s securities regulator suspended a new stock circuit-breaker after a selloff forced local exchanges to shut for the second day this week, signaling that the country’s leadership may reconsider or change the system. The China Securities Regulatory Commission announced the suspension on its official microblog account on Thursday night, adding to concern that policy makers in the world’s second-largest economy are struggling with how to contain the months-long turmoil in its financial markets. The decision came hours after CSRC officials held an emergency meeting to discuss conditions on the nation’s tumbling stock market, according to a person familiar with the discussions who asked not to be named because he wasn’t authorized to speak publicly. China’s CSI 300 Index plunged 7.2 percent on Thursday, triggering an automatic shutdown within 30 minutes of the open, as declines in the yuan rattled investor confidence in the world’s second-largest economy. The nation’s market circuit breakers, which halt exchanges for 15 minutes after a 5 percent drop in the CSI 300 and for the rest of the day after a 7 percent retreat, have been criticized by analysts for exacerbating losses as investors scramble to exit positions before getting locked in. China’s threshold for trading halts looks “quite tight” versus circuit breakers in other markets, Deutsche Bank AG strategists wrote in a report this week. In the U.S., trading is halted temporarily after declines of 7 percent and 13 percent in the Standard & Poor’s 500 Index, and only suspended for the rest of the day if losses reach 20 percent. Chinese regulators moved to ease one of investors’ concerns earlier Thursday, imposing a new limit on the amount of stock that major corporate shareholders can sell. That followed intervention by government funds to prop up shares on Tuesday, according to people familiar with the matter. Authorities are being forced to scale back efforts to let markets have more sway after an end to three months of relative calm on the nation’s equity exchanges. Policy makers went to extreme lengths to support shares in the midst of a $5 trillion rout last summer, including ordering stock purchases by state funds, suspending initial public offerings and allowing trading halts that froze hundreds of mainland-listed shares. China’s central bank is considering new measures to prevent high volatility in the exchange rate and will continue to intervene in the currency market, according to people familiar with the matter. Measures being considered aim to restrict arbitrage between onshore and offshore rates, the people said. The monetary authority didn’t immediately reply to a fax seeking comment. For Hugh Young, a managing director at Aberdeen Asset Management Plc, China’s efforts to intervene in the stock market are counterproductive.